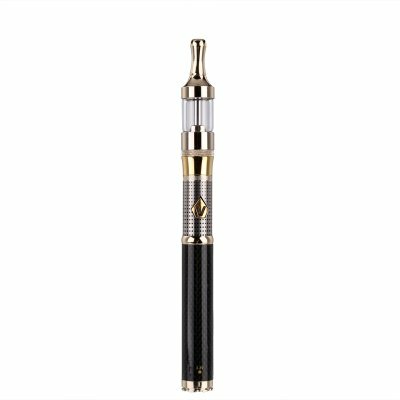 Successfully Added Carbon Spinner 3 Vaper Kit - 1600mAh Battery, 3.5ml Tank, 2.2 Ohm Resistance, Stylish Gold-Plated Design to your Shopping Cart. Meet the Carbon Spinner 3 vaper; an absolutely beautiful vape kit that is great for both experienced users and beginners alike. Featuring a gold-plated Spinner-style battery, black carbon accents, and a gold-plated tank – this high-end vape mod kit certainly is a feast to the eye. Perfect to be used on any occasion, this stylish gold-plated vaper is guaranteed to leave your friends and all bystanders in awe. Coming with all the necessary parts and accessories, this vape mod kit is perfect for advanced vapers as well as beginners that are eager to leave behind harmful tobacco cigarettes and enter the healthier world of vaping. Simply assemble your vaper and fill up the tank with your favorite taste of vape liquid. Featuring a sophisticated 3.5ml tank, this vaper is capable of holding plenty of juice. Along with its 1600mAh battery, you will be able to enjoy countless vaping sessions to come – ensuring that you’ll never be left without power in the middle of a relaxing vape. Fill up your vapor, sit back, and relax – with the Carbon Spinner 3 in your pocket you’ll be all set and ready to engage in a relaxing vaping session at any time of the day. With its adjustable power setting, you will be able to switch in between 3 and 4.8V – allowing you to adjust your vaping style to your exact personal likings. Not only does this power control feature allow you to enjoy your vaping session to the absolute most in the way that suits you best, it also makes this vape pen perfect for both beginning and advanced users alike. Featuring a 2.2-ohms resistance, this vaper is capable of handling sophisticated amounts of Wattage, letting you take the most out of this vape mod kit while it allows you to produce extra-large vapor clouds. Thanks to its high-end gold-plated design and adjustable settings this vape mod kit forms the perfect vaper that allows you to engage in a tasteful and relaxing vape session whenever you feel like it. Perfect to be used on any occasion and suitable for vapers of any level, the Carbon spinner 3 allows you to enjoy all your upcoming vaping sessions to the absolute most while impressing all your friends and bystanders with exceptionally large vapor clouds. The Carbon Spinner 3 vaper kit comes with a 12 months warranty, brought to you by the leader in electronic devices as well as wholesale electronic gadgets..